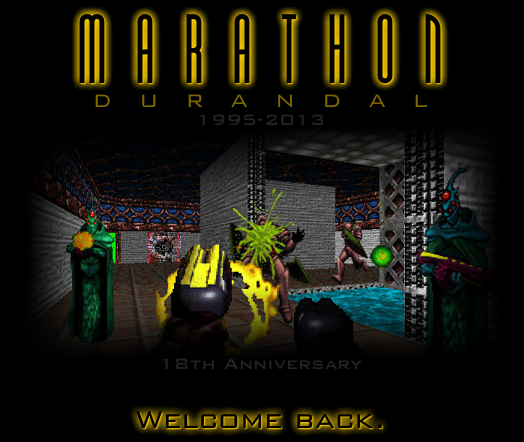 Posted By: PerseusSpartacus Date: 11/24/13 9:16 a.m.
Today, November 24, 2013, is the 18th Anniversary of Marathon 2: Durandal's release. For this occasion, I have decided to release some more visual art for your eyes to feast on. Mind you, it's simple, but that's what banners ought to be; simple, clean, elegant. Yes, that is the Marathon 2 screenshot that uses Hunters and Enforcers where there should be just an empty room. Still, it's classic, and it's the one screenshot that always comes to mind whenever you think of M2. Happy Anniversary, Marathon 2! PerseusSpartacus 11/24/13 9:16 a.m.
Re: Happy Anniversary, Marathon 2! cB557 11/24/13 9:58 a.m.
Re: Happy Anniversary, Marathon 2! Hokuto 11/24/13 1:00 p.m.
Re: Happy Anniversary, Marathon 2! Martin 11/24/13 1:59 p.m.
Re: Happy Anniversary, Marathon 2! Narcogen 11/25/13 2:25 a.m.